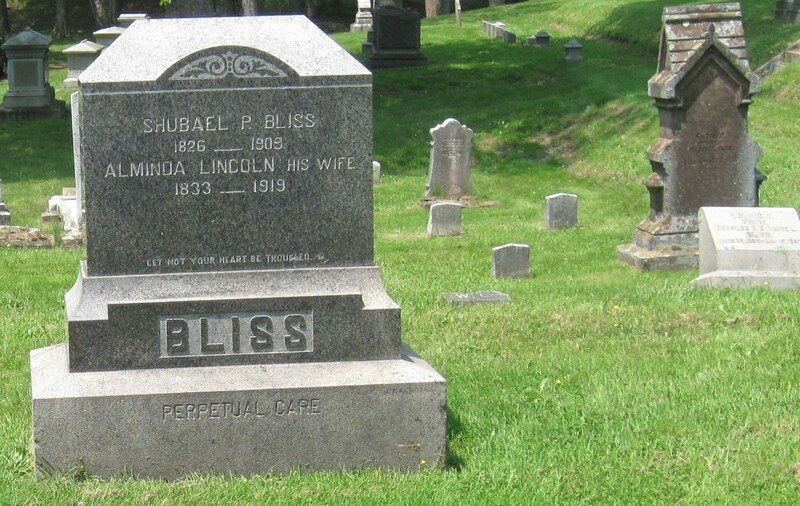 Subael Peck Bliss and Alminda (Lincoln) Bliss are the parents of Dr. Emily Murphy. Subael was born on October 18, 1826 in Massachusetts and died December 31, 1909 in Taunton. His death certificate states Arterio-Sclerosis as primary cause of death and was signed by Dr. Joseph B. Murphy. At the time of his death his address was 16 Kilton St. Taunton, Massachusetts. He was 83 years old. Subael is buried in Taunton’s Mt. Pleasant Cemetery. Alminda was born in 1833 in Massachusetts and died in 1919 in Massachusetts. So far I have not found exact dates for her birth and death. They were married January 11, 1855 in Taunton, Massachusetts.